Principles of Centreless Grinding Explained. The regulating wheel or control wheel. There is also the work to be ground, be it a component or length of material, and suitable guides for supporting the work either as it enters and exits the wheels or as it is ground. 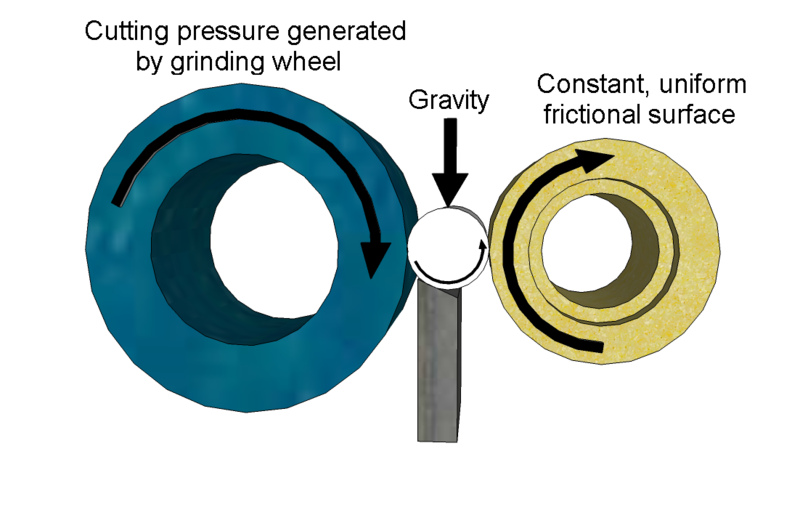 These elements can be arranged in different ways for different types of centreless grinding but the fundamental principle of the centreless grinding process remains the same. 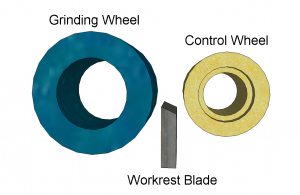 A combination of forces (the cutting pressure of the grinding wheel and gravity acting on the work) keep the work in contact with the work rest blade and the regulating wheel. The regulating or control wheel, which is normally made of a rubber bonded material, provides a continuously advancing frictional surface which ensures a uniform, constant rotation of the work at the same surface speed (peripheral velocity) as the control wheel.